10 Sep 2009 04:41:14 GMT Source: Reuters By Rob Taylor CANBERRA, Sept 10 (Reuters) - Australian police have risked a diplomatic row between Canberra and Jakarta by launching a war crimes investigation into the killing of five foreign journalists during Indonesia's 1975 invasion of East Timor. WHO WERE THE BALIBO FIVE? The five, working for two Australian television networks, included Australian reporter Greg Shackleton, aged 27, and sound recordist Tony Stewart, 21. New Zealand cameraman Gary Cunningham, 27, also died, along with two Britons: cameraman Brian Peters, 29, and reporter Malcolm Rennie, aged 28. They died in the village of Balibo on Oct. 16, 1975, during an Indonesian incursion before a full invasion of the former Portuguese-ruled territory two months later. Their bodies were burned and buried in a single grave in Jakarta. A sixth reporter, Australian Roger East, was killed by Indonesian soldiers on Dili's waterfront in December 1975 while investigating the deaths of the other five. WHY LAUNCH AN INVESTIGATION NOW? 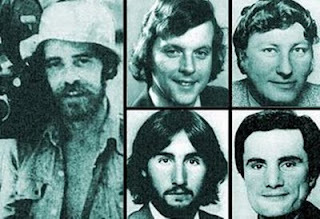 The police investigation comes two years after an Australian coroner ruled the Balibo Five were deliberately killed by Indonesian special forces to cover up the incursion. The timing has been criticised, with foreign relations analysts questioning if it relates to surging interest in the case following release of a major film dramatising their deaths. But the killings have been a high-profile issue in Australia for years due to constant pressure from the men's families for Indonesian commanders and soldiers to face justice. Australia appointed a new national police chief this month, answering to new Home Affairs Minister Brendan O'Connor, who has had a strong interest in the Balibo case for years. Former commissioner Mick Keelty won an Indonesian award for work on the 2002 Bali bombing and was a keen student of Indonesian language and culture. The change in police command may have prompted the investigation, although new commander Tony Negus is also well aware of Indonesian sensitivities. WILL IT CAUSE A DIPLOMATIC ROW? Diplomatic fallout will likely be muted. Indonesian officials and lawmakers will complain about a new investigation and question Australian motives. Both countries have strong ties since Indonesia's democratic transition and neither government will want to press the issue, although Canberra must also satisfy domestic interest. Australia is also a major donor to Indonesia and actively assists Jakarta's military and police to crack down on Islamist militancy. Expect some volatile short-term comment, quickly fading amid the diplomatic reality of mutual need. Australia's Foreign Minister Stephen Smith has already sought to downplay the issue. Interestingly, however, the case could complicate East Timor's relationship with Indonesia more than it does Australia's. East Timor's President Jose Ramos-Horta, in an interview with the Financial Times newspaper this month, called for the killers of the five journalists to be brought to justice, reversing earlier opposition to war crimes prosecutions. That is unlikely to make anyone in Jakarta happy and Indonesia will not be shy to stand up to its impoverished tiny neighbour. Police warned families of the five against building hopes of an extradition from Indonesia, saying allegations of war crimes committed overseas involve "complex legal and factual issues that require careful consideration". The police statement said if the investigation turned up sufficient material to compile a brief of evidence of criminality or a real possibility of criminality, then the evidence would be given to Australia's Director of Public Prosecutions. That evidence will be difficult to gather given Indonesia's reluctance to cooperate. Indonesian law does not recognise war crimes, while the time limit for a murder investigation has expired. Australian police would need to interview surviving witnesses, establish guilt, and then consider lodging an extradition request.